Improved communication adds a vital ingredient to your success and career advancement. On a personal level, you’re ready for more excitement in your love life. Maybe improved communication will help there, too. Increasing your stamina and endurance are key ingredients in your fitness profile this month. You might also enjoy getting outdoors and returning to more natural settings to help balance the time you spend in artificial environments. If you’re in the right relationship your heart will easily fill to overflowing, but if you’re unhappy, you can be really unhappy until you find a way to let more love into your life. Expressing your feelings is the key, and knowing that you deserve to experience fulfillment opens the door during the Gemini Moon on June 13. If you’re pulling away from June 14 to 22, ask yourself why before you react too quickly. With lots of people clamoring for your attention and eager to hear your ideas, you’re challenged to use your influence wisely. 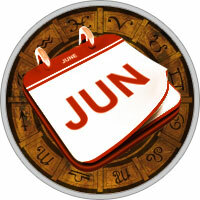 Be wary of the potential for undermining from June 7 to 11, and trust your intuition to help you uncover any deception. Learning more about finances and targeting long-range financial plans adds peace of mind after June 6. Be attentive to jointly held resources before tension builds during the Moon on June 28. Assess what you’re getting in return for your career efforts. If you need more, approach superiors or raise rates near the Moon on June 13.